I love to try new recipes, and grateful that I have a husband who really does not mind. Like he says..."there is always peanut butter and jelly." So, I don't have to worry that if he does not like what I make, he will not starve! Tonight I made Chicken ﻿chimichanga's with a sour cream sauce! They were so good. The recipe said to deep fry, but I baked to make them a little healthier. I have really been into mini books and journals. I had made one to journal Candy and I walks, ok maybe adventures is a better word. The one I made was a book I re-purposed that I had picked up at a garage sale for 5 cents. I liked the book, but after I got done, I realized that all the pages were very dark paper. (I used the paper that came in the book) It was ok if I used a gel pen, but if I used a black pen it soaked though to the other side. So, when Bryan and were at Wal-Mart the other day, I saw these composition books. They are only 94 cents. I thought they would work great for a journal. This is the one I made to write about our walks. How far we went, what we saw and heard. You think you will remember these memories, but you never know. Also made a card for my niece, Skye. I just got this digital stamp and it is my first time using it. It is a very cold, windy, snowy day here. I am not sure how far Candy and I will talk today. I am hoping at least the big block. But am waiting until Bryan gets home from volunteering in case we run into trouble! I wish I would have bought stuff at the grocery store to make a pot of chili. That would taste SO good today! Hope you take time to find some joy and wonder in today. I love baking on these kind of days. I picked up chicken cheap at Hy-Vee yesterday, ( 4 lb package was $3.10) so am baking that for supper. This afternoon, I tried a new recipe for Sugar Donut Muffins. Oh, they are wonderful. The house smelled amazing while they were baking. Plus they are pretty easy! You can see Candy checking them out! Take time to find some joy and wonder in today! ﻿WOW, I think I could get used to this weather. The last 3 days we have hit over 50 degrees. Very uncommon for Wisconsin this time of year. We have yet to have much snow. Candy and I have really been enjoying our daily walks. Today we walked for a whole hour! Ok, we stopped and sniffed a few times. Well, Candy sniffed, I enjoyed the sounds. A bluebird followed us on the bike path from Dempsey Road to Walter Street. Flying from tree to tree, just chirping away. Came home and got a lot done. Made 2 cards for challenges at http://outlawzchallenges.ning.com/ I have done some of their challenges in the past. It feels nice to be back in my craft room. This first card is for the Monday greeting card challenge. You had to make a card sending a hug. The second challenge was to make a card with a tag on it. This is what I did. If you enjoy a challenge. You should check out http://outlawzchallenges.ning.com/ It helps also if you are having creative block. There are a lot of talented people over there, and they make some great cards! Then I made an Applesauce Cake. I am REALLY trying to eat a little healthier. This has very little butter and no oil. You use applesauce instead. OK, the frosting is probably not the healthiest, but by eating the healthier cake they cancel each other out....right? 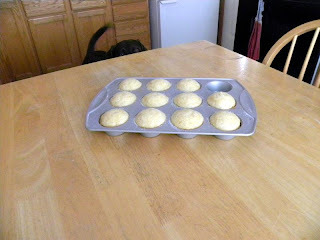 It says to make it in a 9 X 13 pan, but I wanted mine a little thicker so I did mine in an 8 X 8 pan. I have not had any yet. Bryan had one after supper. Must have been pretty good, he had another one before he left for coffee. I hope you all take time to find some joy and wonder in today! I got back into my craft room this afternoon. I made a card for my Grandma (she is really my husband's step-grandma, but I love her like she was my own!) She loves cardinals, so I made this card....just because. ﻿You can't tell but I used a glitter pen on the snow. Looks really pretty. I have been on a mini book kick for a couple months. I made these two. The first one is where I write thoughts to my mom. I miss her so much. I feel like this is my way to still talk to her. Plus it is kinda like cheap therapy to write down what I am thinking. Just random thoughts that pop in my head and remind me of her. The inside is just blank index cards. This last book I made for keeping track of my walks with Candy. I am pretty proud of myself that we have not missed a day of going for a walk. Even in the bad, icy sidewalks. One day it was 10 degrees with the wind blowing at 30 mph. I am going to keep track of our route for that day, and how long we walk. The things we see and hear on our walks. This book I picked up at a garage sale a year go for 5 cents! I took it apart, and decorated the front and pack covers. Tonight is our monthly Young Stroke Survivors/Caregivers support group. We hope to make plans for our year. Usually we don't have a good turn out for this meeting, but hopefully we can get a lot done! Hope everyone enjoys something in today! I hope everyone had a good holiday season. It was a very hard time for me. Really missing my mom, and all the love she put into the holiday season. I hope to spend some time if my craft room this week. I am working on a scrapbook of my granddaughters kindergarten year. It's hard when they don't live close and you have to rely on others for pictures of special moments. But I will make it work! I hope everyone takes the time to find some joy and wonder in each day. Well it does not look good for a white Christmas. Which is probably nice for those who have to travel. I don't want a lot of snow, just enough to cover the grass. Christmas will be a hard day this year as it will be the first time in 51 years that I will not be seeing my mom on Christmas day. I remember how much my mom loved making holidays so special. I remember one Christmas when us kids go up early and there were mud prints on the kitchen floor, the glass of milk we left for Santa was spilled and there were cookie crumbs left in the kitchen. ﻿I could not believe that Santa would leave such a mess. As I got older and was helping my mom get ready for Christmas I asked her about that Christmas morning and the muddy prints. She told me that she boiled water on the stove and then had my dad clear a spot of snow. She poured the boiling water on the spot my dad had cleared and then my she put on my dad boots and got them muddy. Looking back, I should have realized that with the snow and cold there would not be any mud. But my mom kept the magic of Christmas alive, even as we became adults. Made a pot of chicken chili today! It is a grey, damp, chilly day so needed something to warm the ole bones! Thanks for stopping by! Enjoy today! This is about my adventures as a hospital volunteer. And the adventures of my everyday life.